Down stairs garden view with beautiful tropical garden views. Bedding configuration is 1 Queen bed and 1 single bed. Extra guest $65 per night. Including Tropical Continental Breakfast daily. Twin Share. Upstairs Terrace with Magnificent views of the Coral Sea and beach. Bedding configuration is 1 Queen bed and 1 single bed. Extra guest $65 per night. Including Tropical Continental Breakfast daily. Twin share. Upstairs Terrace with Magnificent views of the Coral Sea and beach. Features a larger room with 1 King size bed.42" Plasma TV.Including Tropical Continental Breakfast Daily.Twin Share. 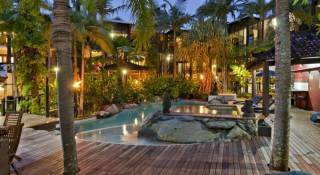 Absolute beachfront with private timber deck and beautiful views of the beach and Coral Sea. With the excitement of white sand just steps from your room. 1 King size bed, 42" Plasma TV. Including Tropical Continental Breakfast Daily. Twin Share. Welcome to Turtle Cove Beach Resort! 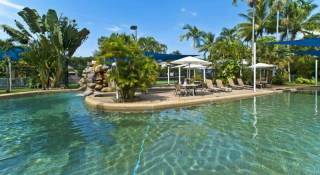 Turtle Cove Beach Resort is a Gay and Lesbian, Adults Only, Absolute Beach Front Holiday Resort near Cairns, Australia. Join us in Tropical Far North Queensland and experience the most fantastic and secluded piece of unspoilt GLBT Paradise in Australia,some say the world. Be assured,Turtle Cove Beach Resort is not your ordinary Gay and Lesbian Hotel! Come and explore our totally private, clothing optional, tropical beach and have the holiday/vacation of your life time! 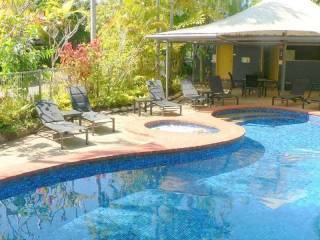 Turtle Cove Beach Resort is an absolute beachfront slice of Gay and Lesbian Heaven and is conveniently located between Cairns, Palm Cove and Port Douglas, it is the perfect place to chill and relax. If you can drag yourself away, both the Great Barrier Reef and the Daintree Rain Forest are on our doorstep. These pristine sites are World Heritage Listed and have to be experienced to be believed. You will find that life slows down at Turtle Cove Gay Resort, so come and have fun, make new friends and take full advantage of our Magnificent Resort. Why pick an exclusive GLBT hotel for your holidays? Because a gay hotel is not saying "we are gay friendly" just to get the "pink dollar". We can't wait to welcome you !! 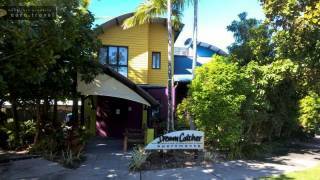 TURTLE COVE BEACH RESORT Gay accommodation Australia is absolute beachfront resort situated on the great barrier reef. TURTLE COVE BEACH RESORT has 30 rooms all of which feature a King or Queen size bed, en suite bathroom, individual air conditioning, ceiling fans, television with in-house video, radio, hairdryer, ISD/STD direct dial telephone with modem point, refrigerator, tea and coffee making facilities, cane and timber furnishings. All have private balconies. The 7 Absolute Beach Front suites are exactly that, all with Private deck.King size bed 42"plasma TV.Relax on your own private terrace overlooking the palm fringed coral sea beach. With the excitement of white sand just a few steps from your suite.. The Coral Sea Terrace Building is set back higher on the resort.TheCoral Sea View King Deluxe upstairs has magnificent views of the Coral Sea & beach,They feature a larger room and King size Bed,42"plasma TV while the Coral Sea View enjoys the same magnificent views and a Queen Size Bed & 1 single bed.The downstairs Garden View Rooms have tropical garden views, Coral Sea glimpses, Queen size Bed & 1 Single Bed. The Garden View Apartment downstairs is just that. it has 2 large decks,fully equipped kitchen, lounge/dining, 1 bedroom & 1 king size Bed. The solar heated pool and rock pool heated jacuzzi are available for use 24 hours. Beach towels are provided in your room. Turtle Cove has one of the best private secluded beaches in the world and it’s all yours. The beach is clothing optional so get those buns brown … but don’t forget to slip, slop & slap. You’re welcome to go in the buff on our private secluded beach,and in the hot tub. Please throw something on in all other public areas. Our modern health fitness centre and massage room is equipped with the latest electronic gym equipment,Treadmills,Elliptical cross trainer,dum bells weights, benches,work station,spin bikes,table tennis etc. This quiet space is yours to enjoy. There is a limited selection of board games, books and a billiard table. Reservations will be confirmed upon receipt of the accommodation charge,Visa and MasterCard are the preferred method of payment, Amex will attract a 3.5%, premium. You must make payment for accomodation booked on the site at the time of booking and you agree to make payment via a debit to your nominated credit card.The amount debited will (subject to the following) be the amount shown on our booking page prior to you clicking the "pay Now" button on that page.Depending upon the currency of the booking,your credit cards currency and the country in which your credit card was issued, your credit card provider may impose foreign exchange fees and other fees which are in accordance with your arrangements with that credit card provider.The full amount of accommodation or package booked will be charged at the time of booking.Any accommodation charges remaining will be charged at the time of check-in. Bookings cancelled 14 days or more prior to arrival attract a $50 administration fee which will be deducted from the full amount paid. For bookings cancelled within 14 days prior to arrival, a 50% cancellation fee or minimum one night fee applies. For bookings cancelled less than 3 days prior to arrival, a 100% cancellation fee applies. No refund applies to unused accommodation for shortened stays. As the cancellation policy is strictly enforced, we strongly recommend comprehensive travel insurance. Please note the special booking conditions for the Mardi Gras High Season. The Sand Bar & Restaurant is located beachfront. A complementary tropical buffet breakfast including filtered coffee and a range of teas is served daily for house guests. Our menu includes a range of refreshing, light meals or if you’re up for it something more substantial...Go for it, you’re on holidays! We offer tantalising a la carte dining using the best of local produce. Last orders are taken at 8.30pm. And just to keep you guessing we offer specials on most nights. On occasions we may do an Aussie BBQ,Buffet night,or pizza night..
We love doing the odd beach bon fire,but that is dependant on the weather conditions. I can’t eat that !! Vegetarian,gluten free and dietary meals can be catered for,if advised when you make a booking or when you check in. Join us at the Sand Bar to enjoy a range of non-alcoholic, alcoholic drinks & cocktails. Depending on the buzz, last drinks are called at 11.45pm with the doors closing at 12 midnight. The bar may close earlier on evenings of low demand. Pool Service is available. If you’re hiding behind a bush, please call us over! Drinks are permitted in the SPA/JACUZZI but for your safety they must to be served in plastic.